This upgrade o horse is................Thunder! "I give you courage. Now you can release your fears." 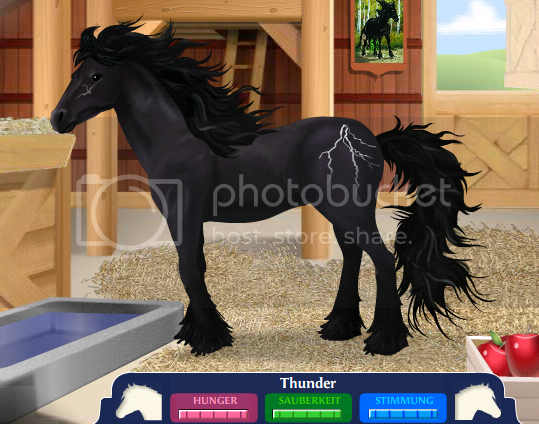 Physical Description: Thunder is a unique horse among unique horses – he’s one of the greatest legendary horse of all time - famous across many worlds. • Coloring: Black with a lightning bolt tattoo on his flank. • Unusual Characteristics and or Markings: Lightning bolt tattoo on his left flank. badge bearing the heraldric symbol of Valeryk (a brilliant platinum lightning bolt). Environment Setting: The Midwinter Mountains is a pristine winter wonderland with dramatic vistas kissed by sixty winters. Thunder is gazing at his ancestral home - the Midwinter Mountain range.